How does an electric (or magnetic) dipole behave in an electromagnetic field, when its velocity becomes comparable with the speed of light? This problem has been solved for the first time in this work, where novel relativistic effects were found. In particular, it has been shown that the concept of “hidden” momentum of magnetic dipoles in an electric field, being disputable up to date, is strongly required to derive relativistically adequate solutions. Moreover, a novel concept of “latent” momentum of electric dipole should be also involved into the description of dipoles. As it is known, the energy and momentum constitute a four-vector in the four-dimensional space-time, which obeys Lorentz transformations. Hence, the revealing of novel components of the dipole momentum leads to the appearance of related contributions to their total energy. As a result, the energy of the ultra-relativistic electric/magnetic dipole occurs essentially depending on the mutual orientation of velocity, electric (magnetic) dipole moment and electric (magnetic) field. 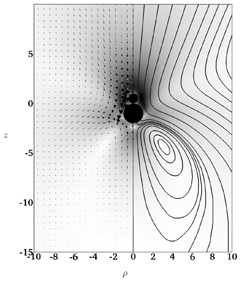 Finally, the role of the known relativistic effects (contraction of scale, dilation of time, Thomas-Wigner rotation of coordinate axes of the inertial reference frame in the successive space-time transformations) is disclosed, while the force and torque on a moving dipole are calculated. Profiles of the photoluminescence intensity (black) and exciton density, nX (red), at 350 mK in a spontaneously formed electrostatic trap (shaded area). 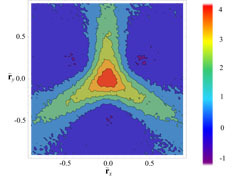 Quantum statistics is signaled by the large density combined to an anomalously weak photoluminescence (darker shaded area). At sufficiently low temperatures, boson-like quantum particles can condense in the ground-state of the system and then form a particular realm called a Bose-Einstein condensate. Semiconductor excitons, i.e. electron-hole pairs bound by Coulomb attraction, shall undergo Bose-Einstein condensation under a priori easily accessible experimental conditions, e.g. below a few Kelvins. However, due to their composite nature, excitons exhibit a dark ground-state, i.e. optically inactive, which has certainly contributed to the lack of signature of exciton condensation obtained through conventional optical probes. In this letter, the authors reveal the dark nature of excitons Bose-Einstein condensation. They report an excitonic quantum statistical distribution marked by a dominant (~ 90%) fraction of dark excitons at sub-Kelvin temperatures. The exciton condensate emits a weak photoluminescence with macroscopic spatial coherence and linear polarization. These signal a multi-component exciton condensation, with a weak bright component coherently coupled to a dominant dark part, as theoretically predicted. Two weeks taken from the 2011 chronicle of the time dependence of the power demand in the French metropolitan territory. Simulating the cost of generating a combination of electricity sources while accounting for the fluctuating nature of energy production and demand provides tools to optimise such energy mix. Increasing reliance on renewable energies is the way to achieve greater CO2 emission sustainability and energy independence. Yet, because such energies are only available intermittently and energy cannot be stored easily, most countries aim to combine several energy sources. Now, in a new study, the authors have come up with an open source simulation method to calculate the actual cost of relying on a combination of electricity sources. They demonstrate that cost is not directly proportional to the demand level. Although recognised as crude by its creator, this method can be tailored to account for the public’s interest—and not solely economic performance—when optimising the energy mix. In measurements of physical observables, how should one correctly account for sample-to-sample variation of disorder? A common practice is to replace an averaging over very many different samples by a single measurement for a large enough sample. This process of self-averaging often works well, while there are cases where it breaks down very strongly: rare realizations dominate the average behavior, which therefore does not coincide with the typical behaviour obtained for a single sample. This was explicitly shown by exact analytical and numerical results in a solvable model of transport in random media. 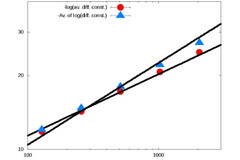 The model comprised a Brownian particle moving in a disordered potential given as a periodically-extended fractional Brownian motion with arbitrary Hurst exponent H. It was revealed that the diffusion coefficient of the particle in a potential of period L is strongly non-self-averaging, with moments supported by atypical disorder realizations: while the typical value decays as a stretched exponential in L with exponent H (blue points), the positive and the negative moments have instead the exponents H/(1+H) (red points), and 2H, respectively (see figure). This work underlines the crucial role of disorder in dictating the dynamical behaviour, thereby cautioning against naive implementation of single-sample measurements. Graph of the normalized empirically found distribution of the American Dow Jones Industrial Average index, DJIA (red squares), and European Euro Stoxx 50 (blue circles) index data with prices recorded every minute data along with the Standard Normal curve for comparison. Analyzing the adequation of financial data structure with its expected fractal scaling could help early detection of extreme financial events because these represent a scaling irregularity. New research shows that the most extreme events in financial data dynamics—reflected in very large price moves—are incompatible with multi-fractal scaling. These findings have been published by the authors. Understanding the multi-fractal structure of financially sound markets could, ultimately, help in identifying structural signs of impending extreme events. In this study, the authors performed multi-fractal testing on two sets of financial data: the Dow Jones Industrial Average (DJIA) index and the Euro Stoxx 50 indexes. They demonstrate that the extreme events which make up the heavy tails of the distribution of the Euro Stoxx 50 logarithmic graph of financial returns distort the scaling in the data set. This means that most extreme events adversely affect fractal scaling. These results contrast with previous findings that extreme events contribute to multi-fractality. Density profile of the collapsed state of 10000 neutrons in the X-Y-plane along the symmetry axis Z=0 (schematic illustration). Polarized neutrons, which interact through incorrect three-body forces, concentrate in small spheres separated by 0.9 fermi. Nuclear systems ranging from light nuclei to massive neutron stars can be well described by nucleons interacting through two-body and three-body forces. From electrostatics we know that two identical uniformly charged spheres repel at any distance but the repulsion disappears when the spheres completely overlap. Similarly, in some modern expressions of nuclear three-body force it is assumed that the nuclear repulsion between the three nucleons is zero when they occupy the same position in space. The authors provide a mathematical proof that such form of the three-body force leads to the collapse of large neutron systems: N neutrons form a bound system with the energy growing as N3 (the effect becomes visible for N > 10000). The density of such system is illustrated in the Figure. Thus, in order to be compatible with our knowledge of neutron stars - where the constituents form dense nuclear matter with a finite energy per particle - modern expressions for three-body nuclear forces have to be carefully assessed regarding their strong repulsive core which should not vanish even when nucleon triples overlap. (a) The reaction scheme. (b) A typical reaction network. Template directed replication of information in polymers is at the essence of living beings, and is believed to be a cornerstone of life's origin. 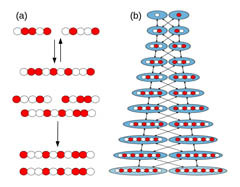 Using a binary polymer model, where polymers act as templates for their autocatalytic replication, we analyze the chemical reaction network in which replicators serve as reactants of each other and compete for common resources. The involved random ligation, degradation and autocatalytic replication reactions are shown in figure (a). Our idealized model demonstrates how autocatalysis in such a molecular ecology completely alters the qualitative and quantitative system dynamics in counter-intuitive ways. We demonstrate analytically that the system features a stationary state where the concentration of polymers does not decrease with length. Numerical simulations reveal a strong intrinsic selection mechanism that favors the appearance of few population structures with highly ordered sequence patterns when starting from a pool of monomers. An example of such a cooperative structure is shown in figure (b). This selection mechanism is due to symmetries in the underlying reaction network, and we discuss how these intrinsically selected species might be in line or in conflict with other prebiotic selection mechanisms. The scattering potential in real space calculated based on the Fourier image. A new theoretical model of the effect of triangular defects in graphene provides numerical estimates of the resulting current rectification with potential applications in security screening. Electronic transport in graphene contributes to its characteristics. Now, the author is proposing a new theoretical approach to describe graphene with defects—in the form of artificial triangular holes—resulting in the rectification of the electric current within the material. Specifically, the study provides an analytical and numerical theory of the so-called ratchet effect —which results in a direct current under the action of an oscillating electric field, due to the skew scattering of electronic carriers by coherently oriented defects in the material. Such theoretical studies of graphene with triangular defects could be used in the detection of terahertz radiation, which has applications in security screening detectors. These are based on the photogalvanic effect, which is the appearance of electric current as result of irradiation of a device or sample material by light. Quantum control in its many facets is a key notion in quantum information technologies. Manipulating quantum states, preparing them according to given specifications, running quantum algorithms and eventually measuring certain observables are some of the main operations requested in almost all applications of quantum mechanics. The quantum gates, or unitary operators, used to do these tasks can be manipulated by modifying the boundary conditions of the system. This has the advantage, over other quantum computation schemes, that no interaction with the bulk of the system is needed. Mathematically, to address the problem of considering different boundary conditions is equivalent to address the problem of fixing different self-adjoint extensions of the corresponding symmetric operators describing the dynamics. We study the space of self-adjoint extensions of bipartite systems and show that their space of self-adjoint extensions is much larger than the spaces of self-adjoint extensions of the separate parties. We exploit this difference to show how to generate entangled states from untentangled ones. As an example we analyze the hybrid system consisting of a planar quantum rotor and a spin system under a wide class of boundary conditions. 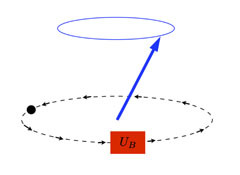 We call this bipartite system a quantum compass (see Figure). Time-frequency analysis of dipole acceleration extracted from the numerical simulations performed in argon, for three different regimes of laser intensity. A new theoretical study elucidates mechanisms that could help in producing coherent radiations, and could ultimately help to achieve high-contrast images of biological samples. Ever heard of the water window? It consists of radiations in the 3.3 to 4.4 nanometre range, which are not absorbed by the water in biological tissues. New theoretical findings show that it is possible to develop coherent radiations within the water window. These could be the basis of an optimal technique to obtain a high-contrast image of the biological samples or to be used in high-precision spectroscopy. Now, a new theoretical study identifies the physical mechanism needed to efficiently generate the harmonic radiations at high laser intensities that occur beyond the saturation threshold of atoms and molecules. These findings, aimed at improving conventional methods of coherent radiation production to reach the water window, were recently found by the authors. In previous similar work, studies focused on hydrogen as the atomic target. In the present work, the authors extend the study to argon atoms. Streamlines, velocity field, and magnitude of the share of the propelling flow attributed to the low level inertial force, in the case of touching spheres. A new study investigates the effects of small but finite inertia on the propulsion of micro and nano-scale swimming machines that could have implications for biomedical applications. Scale plays a major role in locomotion. Swimming microorganisms, such as bacteria and spermatozoa, are subjected to relatively small inertial forces compared to the viscous forces exerted by the surrounding fluid. Such low-level inertia makes self-propulsion a major challenge. Now, the authors have found that the direction of propulsion made possible by such inertia is opposite to that induced by a viscoelastic fluid. This study could help optimise the design of self-propelled micro- and nanoscale artificial swimming machines to improve their mobility in medical applications. The study shows that a rotating dumbbell propels with the large sphere due to intertial forces in the fluid and the small sphere ahead in a pure viscoelastic fluid. The authors then derive the optimal dumbbell geometry for a self-propelling small-scale swimmer. Examples of density profiles seeded by primordial curvature perturbations modeled by gaussian curves of different width. The standard cosmological model is based on the assumption that the Universe is homogeneous and isotropic on a sufficiently large scale. 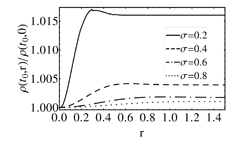 Inflation can give a natural explanation to this large scale homogeneity, through a sufficiently long period of exponential expansion of the Universe, but it also predicts the existence of perturbations of the metric, which are in good agreement with the observed anisotropy of the cosmic microwave background radiation or the large structure of the spatial distribution of galaxies. This is the motivation to study the effects on the luminosity distance of a local inhomogeneity seeded by primordial curvature perturbations of the type predicted by the inflationary scenario. We find that a local underdensity originated from one, two or three standard deviations peaks of the primordial curvature perturbations field can induce corrections to the value of a cosmological constant of the order of 0.6%, 1%, 1.5%, respectively. Our results can be considered an upper bound for the effect of the monopole component of the local non-linear structure which can arise from primordial curvature perturbations and requires a fully non-perturbative relativistic treatment.